Strauss traces Machiavelli back to Heraclitus and Spinoza. It is the modern approach: Truth is subjective or at any rate irrelevant. Analysis and action must focus on the way things are perceived or talked about.
" In God's view, all things are fair [noble] and good and just, but men have made the supposition that some things are just and others are unjust." So Justice does not "really" exist. It is only a creature of man's imagination. Strauss: Why would that make it worthless? Strauss: " By becoming aware of the dignity of the mind, we realize the true ground of the dignity of man and therewith the goodness of the world,[.....] which is the home of man because it is the home of the human mind. Leo Strauss “What is liberal education"
According to Strauss, Machiavelli derogates that "true ground" of human dignity.
" The problem inherent in the surface of things, and only in the surface of things, is the heart of things." Strauss uses it to say that popular opinion ("the surface of things") cannot be ignored if you want to get to the heart of things. That surface is made of opinions, the things people tell each other. 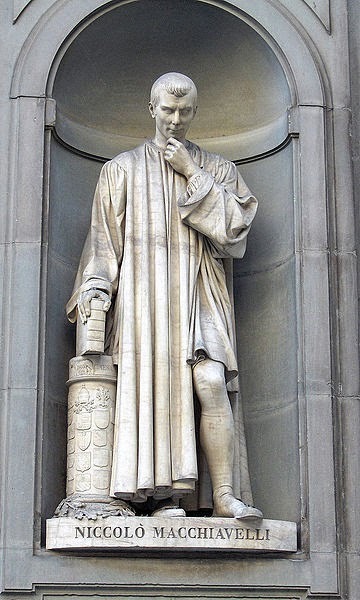 For Machiavelli, that surface is where the relevant questions must begun. 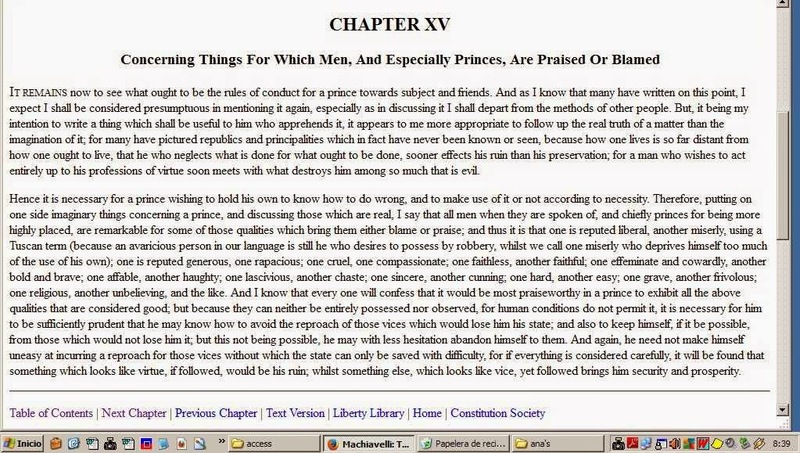 Machiavelli: "Now let's see what ought to be the rules of conduct for a prince towards subject and friends. ............"
Machiavelli: "If everything is considered carefully, it will be found that something which looks like virtue ........ may be his ruin; whilst something else, which looks like vice... brings him security and prosperity." In short: To appear virtuous is better than being virtuous because it is safer. Machiavelli: "COMMENCING then with the first of these, I say that it would be well to be reputed liberal (=generous)." Machiavelli: "However, liberality exercised......... in a way that does not bring you the reputation for it, injures you; for if one exercises it honestly, ..... ... it may not become known." Machiavelli: "Therefore, anyone wishing to maintain ...... the name of liberal is obliged to avoid no show of magnificence; so that a prince ....... will consume ...... all his property, and will be compelled in the end....... to do ......... everything he can to get money. This will soon make him odious to his subjects." Machiavelli: "Thus, with his liberality, having offended many and rewarded few, wishing.............to draw back from it, he runs at once into the reproach of being a miser." In short: To appear generous is better than being generous because it is cheaper.